Bio: Oliver Kohls trained as a naval officer training, achieved a masters degree in politics and international studies and spent many years at sea in the German Navy. As an artist he is self-taught, studying the techniques of the old masters in museums in Berlin, Munich, London, Paris and Amsterdam. Heavily influenced by the Impressionists he is evolving from a realistic approach towards a more free and impressionistic style. In May 2010 he was accepted as a member at the Pastel Guild of Europe and in 2014 he became a Signature Member of the Pastel Society of America. His work was featured in the June/July 2104 edition of International Artist, No 97. Subjects: The sea - as I was posting this, Google were celebrating the life and work of Rachel Carson, and reminded that I once read books The Edge of the Sea, The Sea Around Us, and Under the Sea Wind – titles that perfectly sum up Oliver’s subject matter. Style: Highly realistic but evolving. "Pastel seems to me the most appropriate way to express my artistic feelings and motions. I enjoy the mixture of drawing and painting while I am able to use both hands and fingers. I love the way a painting evolves and the constant dialogue between intention and pigments applied." Navigation: This website is available in German and in English versions. It is clean and navigable – as is appropriate for a sailor-artist. View: Images enlarge in a viewer and may be scrolled. All are labelled with title, dimension and support. Download is not possible on the website without using a screengrab, but may be achieved on Oliver’s excellent blog. 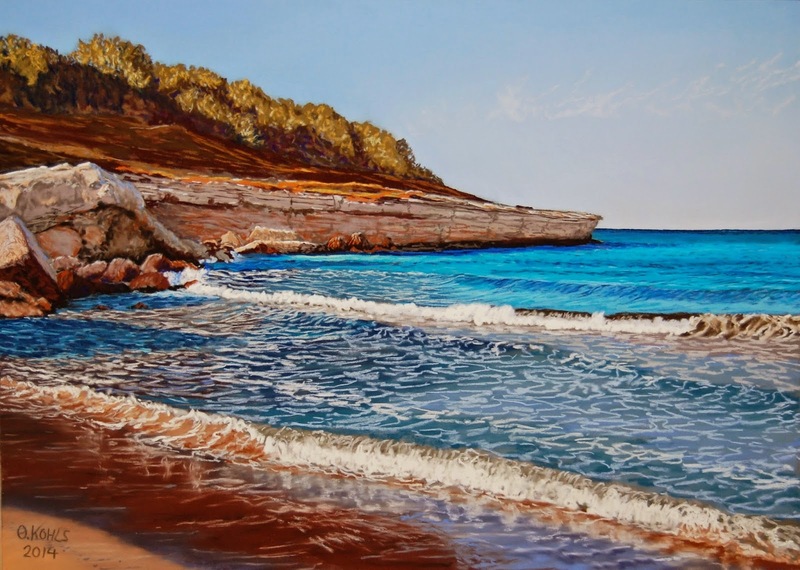 Anse de Sainte-Croix II is 50x70cm. Bio: Christine Russell was born and educated in London, England and having nurtured a passion for drawing and painting since childhood, embarked upon a full time painting career in 1993. Christine worked for the Royal Opera House for a number of years, both on and off stage, during which time she met and was influenced by a theatre designer who produced a collection of exquisite designs in pastel. Over the years, Christine has taken on many private commissions in the U.K. and the Middle East and has been exhibited at a number of prestigious galleries. In 1996 she was invited to become a full member of the Society of Women Artists, where she has served on the Council and Exhibition Selection Panel. For the past 11 years she has shared a studio in Gloucestershire with her daughter, Claire, a picture framer and gilder. Her time is divided into painting for exhibitions, running courses at her studio, at Marlborough College Summer School and abroad. She has travelled widely and this love of travel is combined with tutoring painting holidays in Spain, Italy, Morocco, Cuba, India and Sri Lanka. This aspect of her work was featured in the June/July issue of Leisure Painter. Demonstration pieces and articles have featured in a number of other publications: Masterstrokes, Pastel and Painting Great Pictures From Photographs (books published by Sterling Publishing inc), Who's Who in Art and The Society of Women Artists Exhibitors, 1855-1996. The Collins Artist's Sketchbook, and in The International Artist and Pastel Artist International magazines. Subjects: Still Life. Inspiration is drawn from a diverse range of subjects, from classical fruit, flowers and musical instruments, to sassy high-heeled shoes and modern packaging. Her motivation is always driven by the keen observation of the subtleties of light on surface texture and it is for this reason that she works directly from lovingly constructed still life sets, rather than from photographs. 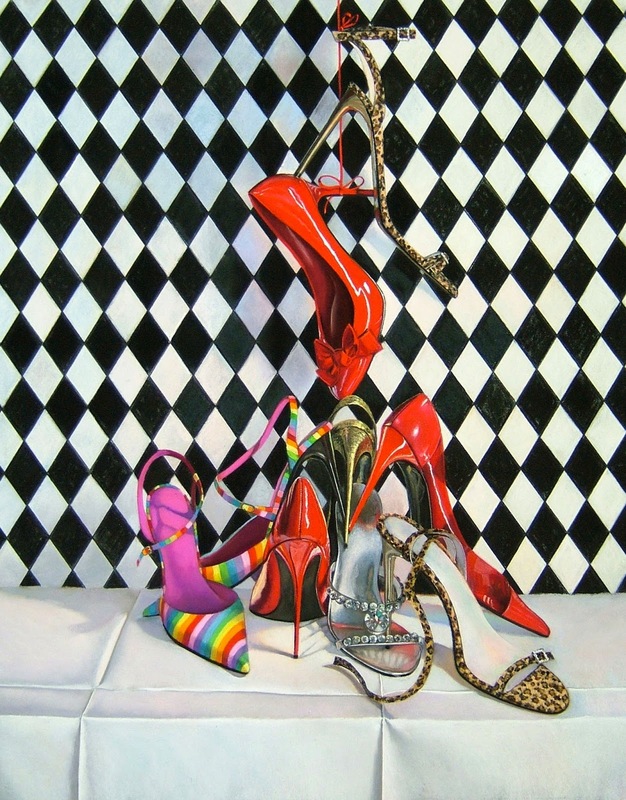 Style: Highly detailed still life has become Christine’s speciality and forms the major body of her work. As an antidote to fine-detailed work, she occasionally likes to “crawl out from the end of the microscope” to paint landscapes and other subjects, often inspired by the places she has visited on her travels. These are more impressionistic and experimental. Occasionally she works in oils, preferring to use almost neat paint, often applied with a knife. Technique: Soft pastel is her primary medium of choice, as she enjoys the immediacy and vibrancy of the sticks made from almost pure pigment. She will often apply an under-painting in acrylic ink or watercolour, which helps to establish the tonal qualities of the piece at the initial stage. This is allowed to show through in places as the picture progresses. Gallery: Fruit paintings; Flower paintings; Shoe paintings; Still Life; Landscape. Image View: Images present on each gallery page as thumbnails and do not enlarge. No indication is given of dimension. Bio: Polish artist Jerzy Moscicki was born in 1954. He studied at the National High School of Plastic Arts, and the Universities of Wroclaw, Nancy and Orleans. Now living in Lyon, France. He has devoted himself exclusively to painting since 1990 and is represented in numerous private collections. His work may be seen in La Galerie Bellon, 11 rue de la Plage, St Jean de Monts, a popular holiday destination in the Vendée. Style: Representational. "From my style, I stand in the tradition of value painters - before seeing the color, I look at the light. 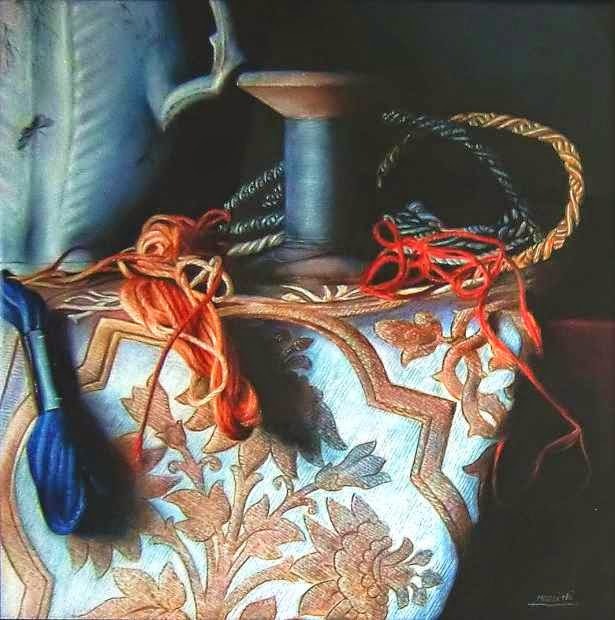 I'm attracted to this particular relationship between light passing through the colored shadow… Through hundreds of paintings, oils, pastels and watercolors, mostly still lifes, I have told the history of objects, always via the realist convention of chiaroscur. It taught me the art of the painter." Navigation: Website is in French but provides translations in 52 languages via embedded Google Translate. Bio: Seattle artist Barbara Noonan is often to be found painting at her studio in the Pioneer Square section of downtown Seattle. Barbara is a Signature Member of the Pastel Society of the West Coast and the Northwest Pastel Society. She teaches pastel painting in Seattle and is frequently asked to do painting demonstrations in local art groups. She has studied with Richard McKinley and Bob Gerbracht, and with the Mitchell Albala Critique Group. 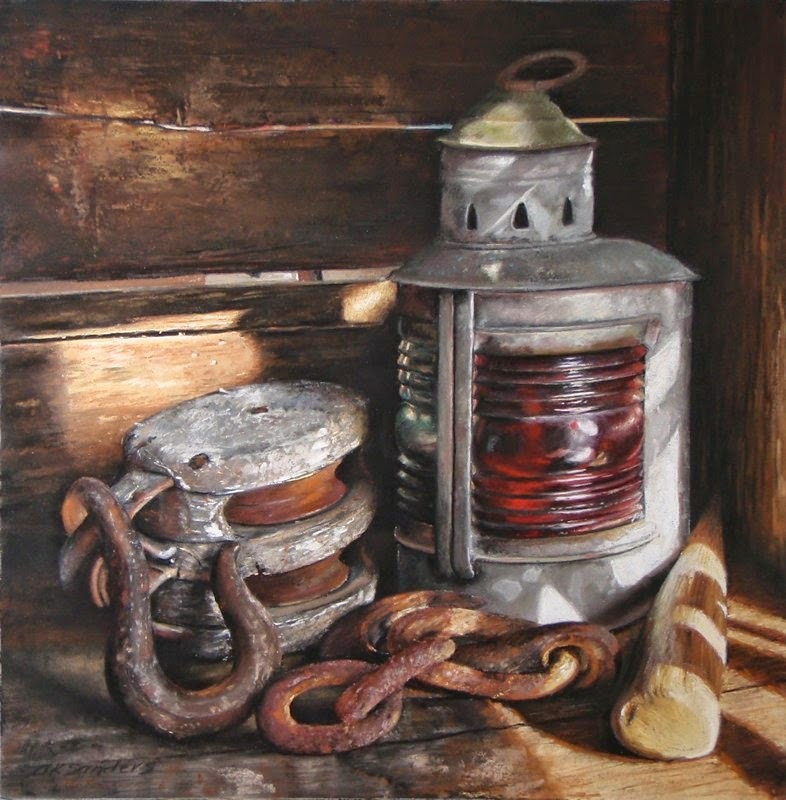 Her work was featured in the Pastel Journal, February 2013; and she was awarded an Honorable Mention, in the Abstracts section, the Pastel 100, 2013. Her work is to be found at the Childhood's End Gallery in Olympia, WA, Simon Mace Gallery in Port Townsend, WA, and at the Women Painters of Washington Gallery, Seattle. Style: Loose representational to quite abstract depending on subject. Technique: Barbara’s work is directed by the watercolor underpainting in each piece and her pastel strokes are in response to these shapes and patterns. What her imagination generates is typically an abstracted landscape but not every time. Barbara says: It’s taken years for me to carefully study and then paint the light and shadows but they often felt overworked. Distillations is my latest series leaning towards the abstract. I’ve purposely paired down my strokes of soft pastel over a watercolor wash to provide only the essential information; creating a sense of place… My mark making is intentional and expressive. Thicker strokes offer weight while lighter strokes provide lightness and breath. When layering colors I’m conscious of nature’s atmospheric influence especially as the sun emerges or dwindles. Image View: Thumbnails enlarge in viewer anmd may be further enlarged; information is provided on medium and size. Download is allowed. Mellow Mountain is 16 x 16 ins., 550 x 547, 173 KB. Bio: Massachusetts artist Amy Katherine Sanders is largely a self-taught artist. She studied with Ron Parent for several years and also painted under the direction of guest artists at Truro's Castle Hill Center for the Arts. 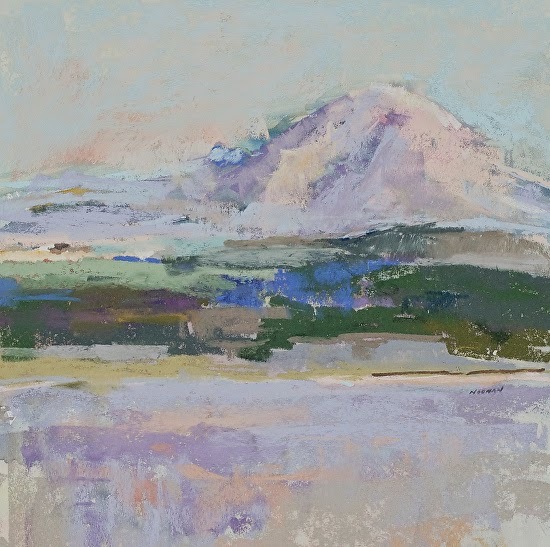 She considers pastel to be her primary medium, although originally she worked in watercolors and was a member of the Connecticut Watercolor Society for many years. She still paints occasionally in watercolors, and even acrylics and oils, but she finds the richness of pastel color and its flexibility allow her to capture more expressively the beauty and depth of the scenes that she is drawn to paint. Amy is a Signature Member of the Pastel Society of America. Her paintings have been sold in a series of auctions to benefit Truro's Castle Hill Center for the Arts and the Truro Historical Society. She has exhibited in galleries in Connecticut and on the Cape, and has been represented by the Addison Art Gallery of Orleans, Mass. since 1998. Amy was the Feature Artist, International Artist magazine, December 2010/January 2011 issue (#76) on creating paintings from photographs; Feature Artist, IA, February/March 2011 issue (#77) on using multiple layers and colors to create interest in pastel; and Feature Artist, IA, April/May 2011 issue (#78) on utilizing a wide range of values to increase depth in pastel. She was included in the Artists feature in January/February, 2011 issue of the Pastel Journal; and in a piece featuring the depiction of the many faces of water, in the December, 2012 issue of the Pastel Journal. Navigation: Main menu remains available on sidebar or on top of page. Site last updated August 2012. Gallery: PASTELS – Landscapes; Stones and Shells; Animals; Seascapes; Miscellaneous; Figures - ; PRINTS; OILS. Image View: Thumbnails enlarge in viewer while the thumbnails remain scroll on top; information is provided on medium and size. Images may also be viewed in a slideshow. Download is provided for. Heritage is 10 x 10 ins sq, 786 x 800, 123 KB.